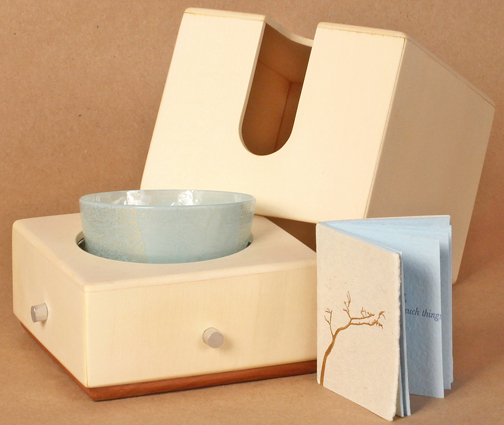 Fine letterpress printed miniature book on custom handmade Cave papers; Sculpture: Hand blown glass egg with robin’s egg blue & gold leaf by Kevin Shluker; Box: Custom 4 1/2” cube crafted of holly & cherry woods by Rainer Facklam. After four years of planning, Intima Press is proud to announce a new sculptural book edition. Noted poet Phillis Levin’s delicate lament End of April is brought to life by artist Mindy Belloff. The viewer is lured by a custom cube crafted of fine holly & cherry woods. Upon opening the box, a precious book is found nested inside an elegantly hand blown glass egg which rests comfortably in one’s hand. 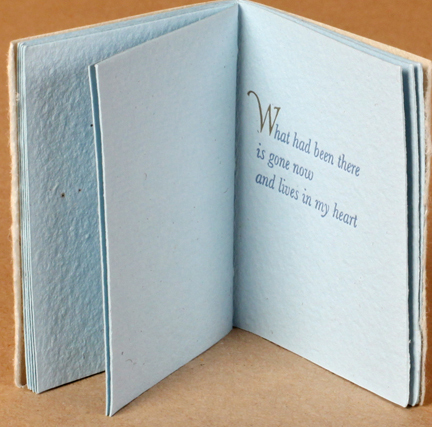 The miniature book, with poem letterpress printed on handmade papers, opens to reveal the beauty of nature and heartache of lost love. Special Edition of 25, $1,400.